Nearly ten years ago, I delivered the opening talk at TEDGlobal 2007, the first TED event in Africa. I told the story of a continent on the move, focusing on entrepreneurs and the growth that was taking place. In the decade since, Africa has continued to change its image and control its destiny, despite upheaval and economic headwinds. At the time, few people had even seen this image. Later, Google founder, Larry Page, asked me where I had found it, saying he had a ‘passion for maps’. What intrigued him was the vision of the entire earth at night; which is, of course, pure fantasy. Part of the world is always in daylight. Page, along with Sergey Brin, had created a map that showed all Google searches that were taking place at a given moment. He told me that his map mirrored the map I had shown. In other words, where there is electricity, there is usually the Internet. Google, at that point, was planning the Africa strategy for many of its ventures, and it struck me that a dynamic organization is one whose leaders seek ideas from multiple sources, look for the latest thinking and latest areas of activity, and are not afraid of the unknown. They see opportunity and engage intelligently. The Arusha event came at a time when leaders across the world were developing themes we now take for granted in the Africa narrative: the value of the demographic dividend, smart growth in different regions, the need for good governance, and the power of partnerships and local context. Africa and emerging markets have continued to develop as growth engines and Sub-Saharan Africa remains one of the fastest-growing regions in the world. The 2016 BCG Global Challengers report emphasizes that, “…despite the slowdown in macroeconomic growth, the drop in commodity and currency prices, the crash of equity markets, and the rise of geopolitical risks, the top companies from emerging markets have kept on expanding overseas.” This list of 100 companies includes seven African Global Challengers this year, five of them from South Africa. The economies of some emerging markets may have paused; certainly South Africa is facing headwinds from GDP growth and currency volatility, pressure on infrastructure (power generation), and drought. But local markets are both resilient and growing, and the overall growth of Sub-Saharan Africa is allowing the narrative of the Africa growth story to remain on track through this cycle. The depth of institutions and governance in key areas coupled with strong sectors and management remain hallmarks of resiliency. As the Global Challengers report states, “… the top companies from emerging markets grew three times faster than their counterparts in mature markets from 2009 through 2014.” This continues to be the prediction for the long-term narrative for not just emerging markets but for Africa and Africa’s Global Challengers too. Fact: Africa is the second-largest continent in the world. If that still surprises people, it’s likely because maps used in schools typically show Africa as smaller than it really is. Fact: Africa is made up of 54 countries, each with its own unique economic climate, growth opportunities, and value propositions. The question for entrepreneurs and corporations is not: Should I invest in Africa? It is: Where in Africa should I invest? Because of the distinct economies, the most successful investors will have “contextual intelligence”—global knowledge informed by a deep understanding of local needs and preferences. Fact: There are extraordinary business opportunities in Africa. 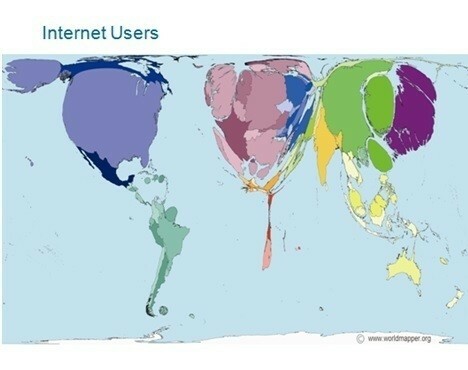 The maps below show the countries of the world inflated or deflated according to availability of services. 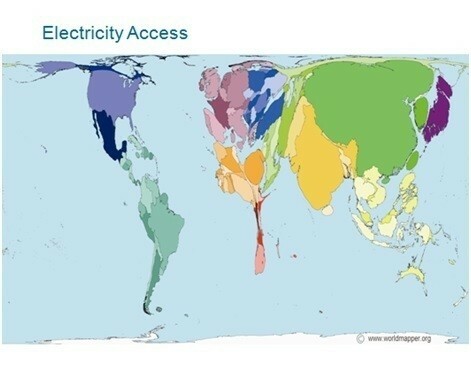 Many investors look at Africa and see obstacles: an immature electrical grid, limited Internet connectivity, untarred roads, minimal banking. They see the thin line that is Africa and feel discouraged, when in fact there is real reason to feel the optimism of opportunity. Here again, the view of Africa is distorted. At the heart of each challenge lies extraordinary opportunity. Especially in the area of digitization, a growing population of consumers with increasing needs and expectations—a population becoming ever more connected within and across borders—presents an opportunity we must not miss. For investors, the fact that Africa is often misunderstood, overlooked, and undervalued is one of its greatest strengths. 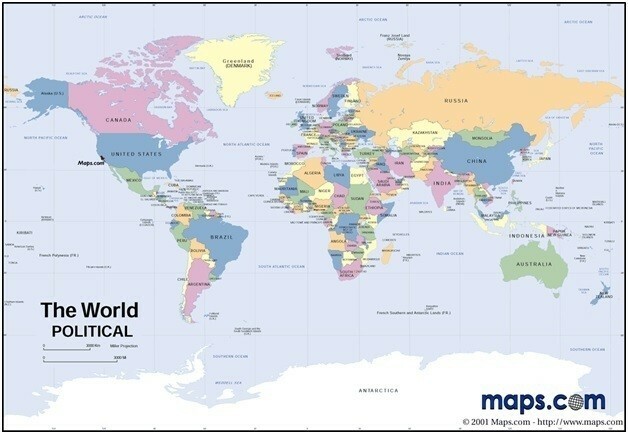 Imagine what the world would look like if we turned it upside down. Africa would dominate the map. Leaders who can see Africa’s true potential through this lens of a ‘world turned upside down’ or depending on one’s perspective, a world in its proper position, stand to be the agents of innovation delivering value to millions who are currently underserved. We would be wise to learn from Zuckerberg and Page’s thirst for first-hand knowledge of markets and their ability to engage local leaders and then place smart bets. These traits are what brought Page to Tanzania in 2007 and led Zuckerberg to attempt to launch his satellite. For me, it was a lucky convergence: to be speaking at TEDGlobal in Africa and to be able to spend time with Page, a man uniquely qualified to see the potential of the continent. The spirit and stamina that moved Google from a global challenger to a global leader is in the DNA of today’s actual Global Challengers from Africa. I can’t wait to see how their journeys map out in the next decade. Opinions expresses are those of writer alone.